The gold price ended higher on Wednesday as safe haven demand returned and investors in exchange traded funds continued to buy the metal. In another day of heavy volumes with just under 33m ounces changing hands on the Comex market in New York gold for delivery in December edged up to $1,333.60 an ounce. 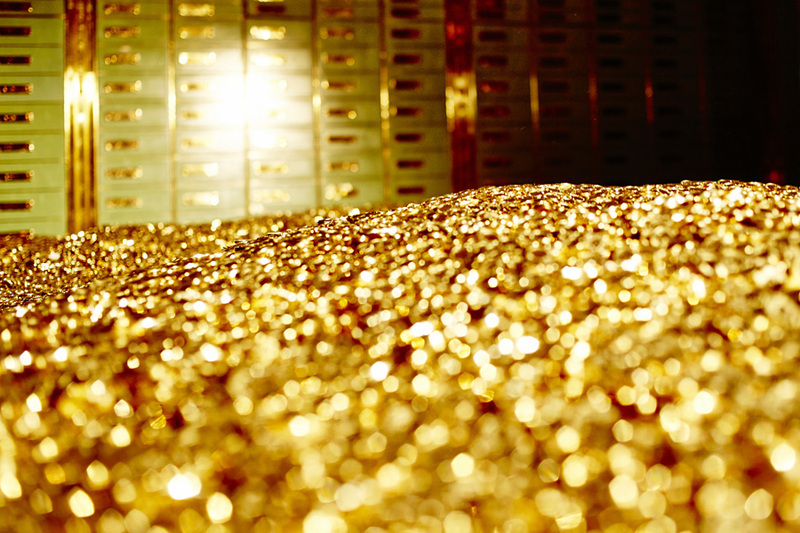 Gold dipped in the morning after unexpectedly strong jobs figures and a jump in inflation put a hike in US interest rates back in focus. But the losses were reversed after North Korea responded to new sanctions by threatening to "sink" Japan and beat the US to death "like a rabid dog." Despite the pullback from one-year highs over the last week, gold is still trading more than $120 an ounce higher than its summer lows struck in early July. 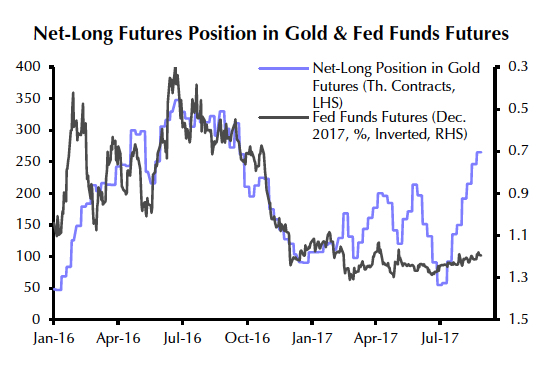 Hedge funds speculating in gold futures and options have built up long positions – bets on a rising price – for seven straight weeks and in a recent commentary Saxo Bank pointed out that the ratio between long and short futures positions is at a near five-year high at 20 longs per 1 short. 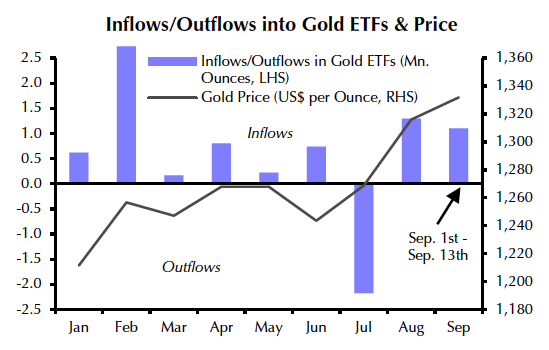 Gold bulls have also continued to pour money into gold-backed ETFs with September shaping up to be one of the best months of 2017. Instead, we think that the surge in net longs and the inflows into gold ETFs reflect safe-haven demand on the back of an escalation of the North Korean crisis.